At CSI Closets & Storage, our goal is to have your new closets installed as soon as possible so you can begin to enjoy the benefits of a clutter-free life! 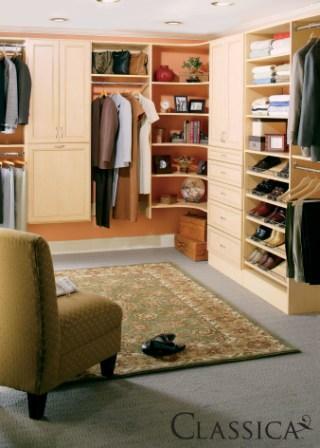 Our method of closet planning and installation is simple and designed for speed and efficiency. First, we will ask you to take a hard look at the storage area you want to improve. Assess what is there. Ask yourself what should be stored there and what can either be moved somewhere else or eliminated. This is a great time to sort, pare down, or give some things away to charity. How about that yard sale you've been wanting to have? Thinking about the things that need storing and organizing will lead to the best closet components for your individual needs. Next, group items into categories. For instance, in a closet, how many long hanging items do you need space for? How many short hanging items? What should be stored in drawers or on shelves? Count the number of pieces. Click here to use our convenient closet and storage surveys to inventory the items to be stored! Take careful measurements. Measure the wall lengths and the ceiling height. Note widths of door and window openings (outside trim to outside trim). Note slanted ceiling heights and the location of any outlets, switches, air intakes or vents that must be considered in the design. Also note the kind of walls you have--drywall, plaster, concrete, wood or other. Is there anything behind the walls our installer should know about, such as plumbing chases, ducts, or pocket doors? Click here for a how-to-measure diagram. With your measurements in hand (photos are most helpful, also), visit our showroom to see our displays and discuss your goals and requirements with our designers. You will learn about the many options that are available for closet customizing, finishes, and price levels. Your designer will prepare a closet design for you based on your needs and specifications. Then you will meet with the designer to review the proposed plan and pricing for the closet system and installation. A 50% deposit is required to place the order. Next, the designer will schedule a visit to your home to take field measurements. We have a very quick turnaround time with Schulte! It will take from one to two weeks from the time your order is placed until we receive it in our warehouse, where it will be inspected and checked for accuracy. Meanwhile, our project coordinator will contact you to schedule a convenient time for installation. As Jay Rambo Co. builds your closet cabinetry to order, the lead time is a little longer--ten to twelve weeks. Prior to installation, we ask that you completely empty the closet or area to be installed. If you are planning to paint, please have the area painted prior to installation. (You may contract our Handyman Services Division to demolish the old closet, prep walls and paint for you, if you prefer! Just call 770-729-1999 for a quote.) All that we ask is that there is a clear space near the area to be installed for our installers to work in and a place for them to set up their equipment (usually the garage). After the closet installation, our installer will review your new closets with you and explain how easy it is to make adjustments like moving the shelves or hanging rods. Your remaining balance will be due at this time. We want to be sure that you are completely satisfied with your new storage components! Your designer will call to make sure everything is as you expected and may request permission to take photographs. We know that you will be so pleased that you will want to refer us to your friends and neighbors! At CSI, "Others promise, CSI deliversTM," is more than just a slogan, it is the philosophy we live by.